'Silhouette Series' half round trash cans are perfect for any setting. The space saving 'Silhouette Series' half round trash receptacles elegantly place against walls for ease of use and an architectural flair. Includes a leak proof rigid liner. 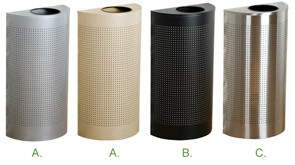 These trash receptacles are perfect for hotels, airports, office buildings, and more. A rigid leak proof plastic liner is included with each trash receptacle.